In anticipation of a short chip and a putt from Kasane to Victoria Falls … the morning took on a relaxed mood starting with our departing photoshoot at Mowana Safari Lodge and Spa. 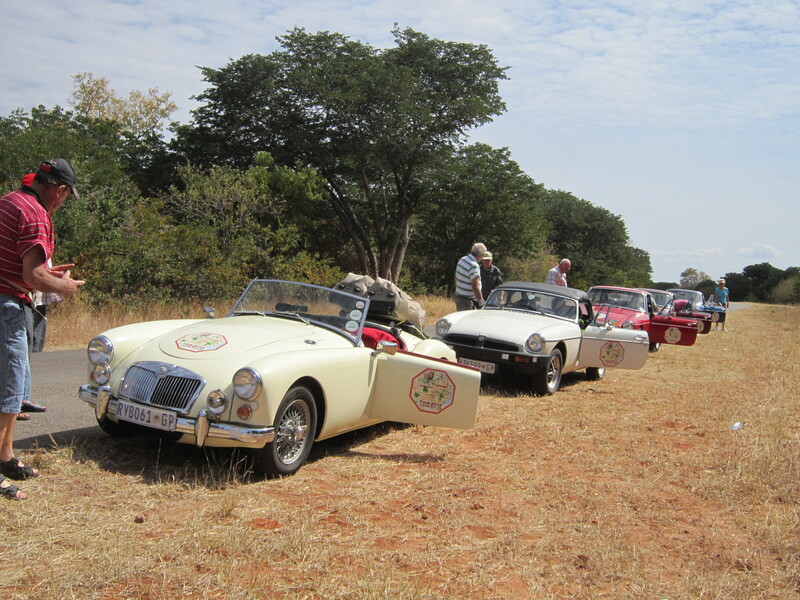 Then on to the border starting with a push to get the Forbes’ MG going – they were advised not to buy a new battery locally. Despite being briefed, the abundance of opinions, instructions, suggestions, directions and every other possible “ions”, the border clearance was a wee bit chaotic, but still only took a little over an hour. Someone in the Group suggested that we pen details of the procedure which will follow at the end of this story and after we have ‘done’ Beit Bridge on our return to SA. 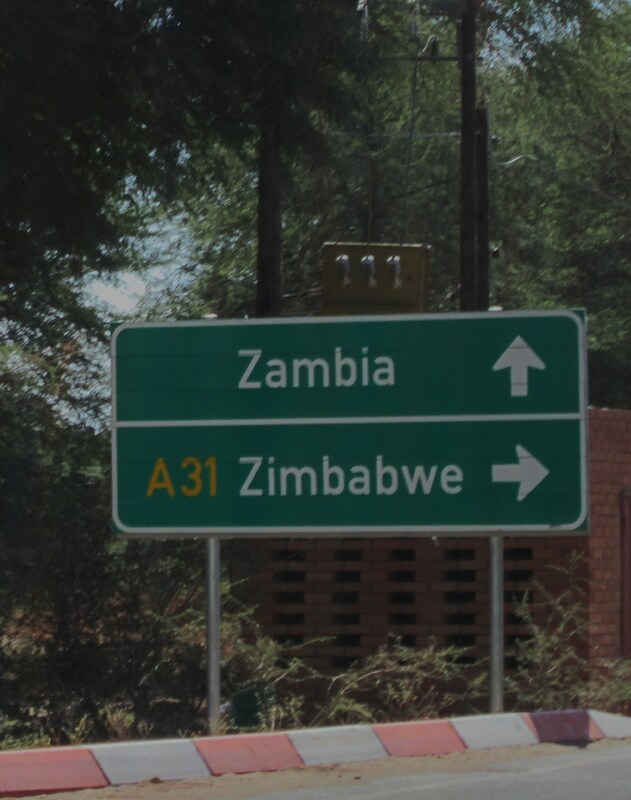 TIP OF THE DAY plan to cross the border over late morning and not first thing or late afternoon when the tourist day trippers are transferring between Chobe and the Falls. A slow drive to the Falls keeping to the 80kms speed limit whereupon PJ’s Maggie suddenly presented a brand new rattle in the front right which got progressively louder …. 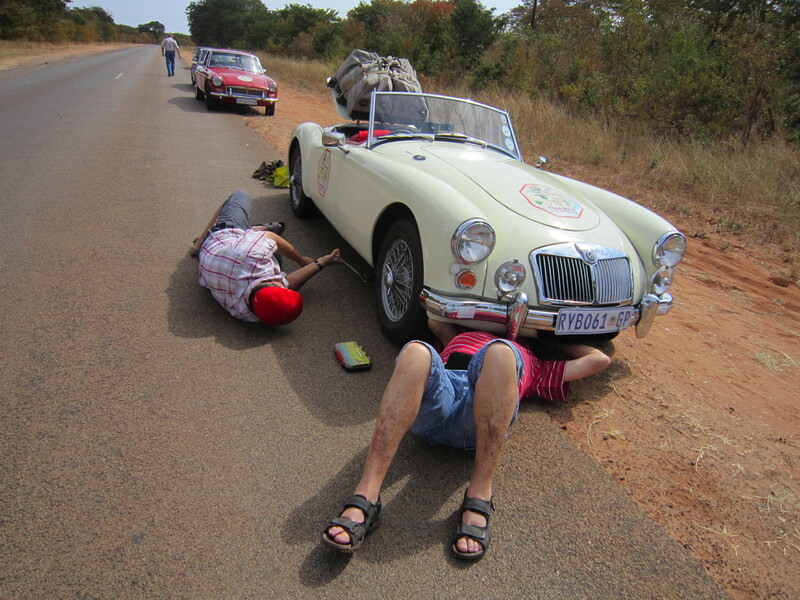 Having blown the Prado engine with something stuck in the radiator last year … near hysteria from me and some serious unease bubbled up as we drew to a halt with the entourage behind. PJ hailed Clive with the support vehicle and trailer to carry us the last 10kms to Vic Falls and before some serious damage was done. Mike Brett quickly found the problem and replaced a suspension bolt from Koos’ “proverbial bag of bolts” . 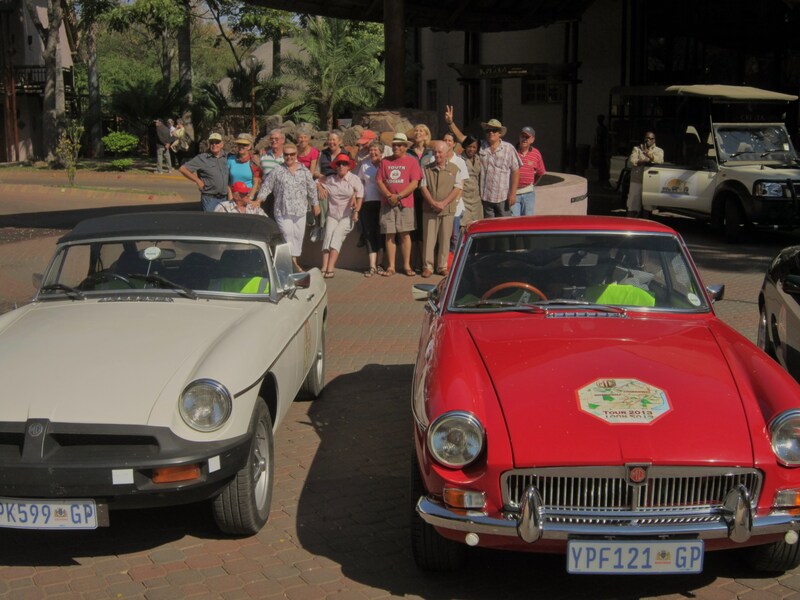 We drove through the town to much waving and cheering straight into the porte cochere of the Victoria Falls hotel for our group photo. 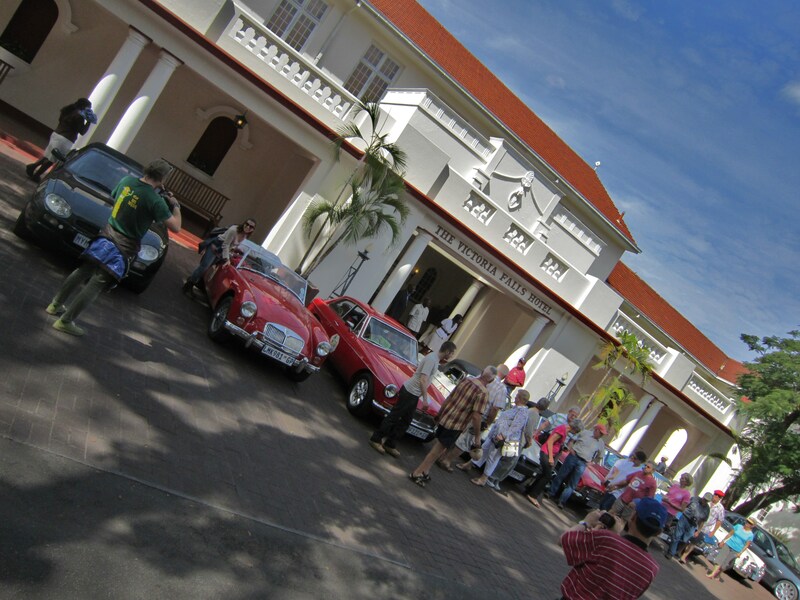 Arrival Victoria Falls Hotel – a renowned Grand Old Lady! Angela & Simon of Arrive in Africa had arranged a Group checkin for us in the gracious Bulawayo room after which they dealt with each person in the Group to advise and select activities from the huge range on offer …. Bookings where received for sunset cruise, white-water rafting, helicopter flips and the new Tram sunset ride onto the Bridge. The Group thoroughly enjoyed the Dabula sunset cruise and raved about what a great host Tinashe was, even fully up to speed on our trip having followed us on the blog. Now that was some serious attention to detail. We feel seriously special! Dinner at the Victoria Falls Jungle Junction was very good, accompanied by the tribal dancers in stunning costumes. The Bretts’ managed to acquire a Fridge for their bedroom – the hotel produced a standard domestic fridge from who knows where but again the personalised attention is remarkable. The Groups splits into the 7 day and 14 day versions on departure from the Falls – 4 off to Bulawayo and the rest on to the Kariba Ferry. Hi Suzi well done for your fabulous and informative blog on your MG trip. I am really enjoying following your journey! Keep it up and keep dodging those potholes!